Attorney Mike Schafer of The Schafer Law Office seriously warns golf cart operators to be careful especially when driving on public roads. Personal Injury Attorney Mike Schafer today said golf cart operators should be much more careful while driving to reduce the escalating number of golf cart-related accidents in Kentucky. “More Kentuckians are being injured by golf carts. Victims typically suffer from back, neck, head, knee, shoulder, and soft tissue injuries,” Schafer revealed. The American Journal of Preventive Medicine has reported that injuries from being hit or falling off golf carts jumped 132 percent from 1990 to 2006. Mr. Schafer emphasized that most golf carts lack safety features like air bags, seat belts, and anti-lock brakes. He added that these features are essential as they are designed to prevent injuries in accidents. “When there are no safety features, you have to exercise carefulness especially if you decide to take your golf cart on a public road. If you have been hurt in a crash, the injuries can be devastating,” Schafer warned. In Kentucky, a person is allowed to operate a golf cart on a public roadway. 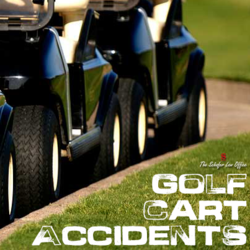 Schafer explained that if you were involved in a golf accident in Kentucky, you may seek compensation for injuries and damages since a golf cart operating on a public road shall be insured by the owner or the operator. “As a Kentucky Personal Injury Attorney, I encourage all golf cart owners and operators to apply safe and appropriate operating procedures. As much as possible, wear the proper personal protective equipment and clothing. Also remember to slow down when driving on a public road. And of course, do not drink and drive. Obviously, alcohol does not mix with any type of motorized vehicle. People need to use self-constraint, especially on a golf course,” Schafer stated.